Have you ever wondered why a carrot or sweet potato is orange or why broccoli is green? The answer is carotenoids—compounds that color dark green vegetables and color orange, red, and yellow fruits and vegetables. One important carotenoid with antioxidant properties is beta carotene. By consuming fruits and vegetables rich in beta carotene you can help keep your body healthy and happy. 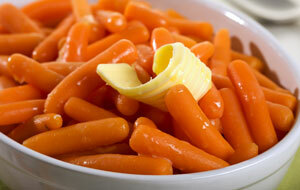 In the body, beta carotene is stored in the liver, and from there the body converts it into vitamin A. And beta carotene may help increase memory and protect your cells from free radical damage. Some fruits and vegetables that offer a rich source of beta carotene include: broccoli, cabbage, cantaloupe, carrots, green leaf lettuce, kale, mustard greens, pumpkin, red leaf lettuce, spinach, sweet potatoes, turnip greens, and winter squash. These beta carotene-rich foods can be enjoyed in many ways, too. Add spinach to wraps, bake some sweet potato shoestring fries, use green leaf lettuce to make Asian-style chicken wraps, and enjoy carrots with your favorite dips. Take note! If you notice that your skin seems yellowish on the palms of your hands and soles of your feet, you may had carotenodermia—excessive consumption of beta carotene. This condition is not associated with any toxic side effects but you may want to reduce your beta-carotene intake!